Bhatura | Chole bhatura is a most popular punjabi recipe. Whenever we go to restaurant bhatura is a the first one Varun will order. 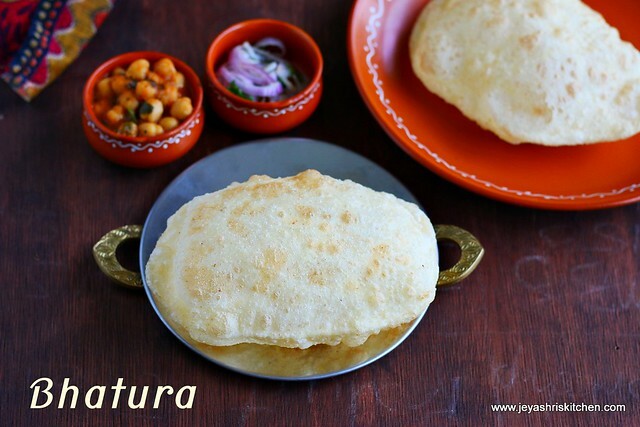 I have request from readers for a long time to post this recipe of bhatura. I have tried this twice from a popular cookbook, but it didn't turn out well. Yesterday when i had soaked frozen chole, i planned to make channa masala. Then this thought of making chole bhatura came to mind and tried this again from here . It turned out very perfectly. 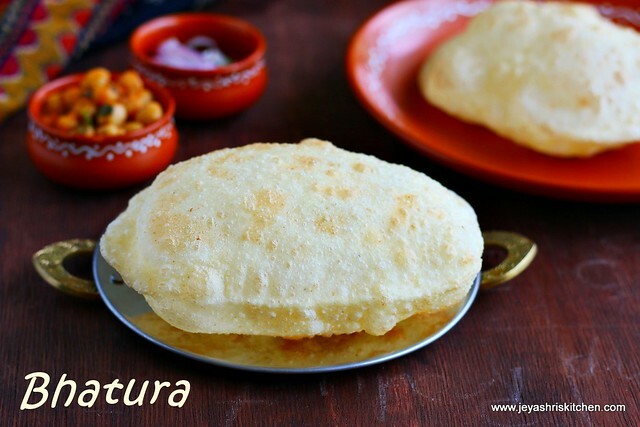 Try out this easy recipe of bhatura recipe and let me know how it turned out. Oil 3 tsp + for deep frying. In a wide bowl add the plain flour, sooji, baking soda, sugar ( i used raw sugar) yogurt and salt. Mix well and add water little by little to make this into a dough. It should not be too soft or too stiff. Add 3 tsp of oil to this and knead this well again. Cover this with a damp cloth and keep it aside for an hour. Even if you have time you can keep it 2-3 hours. Make equal big lemon sized balls out of this and keep this aside for 10 minutes. Meanwhile keep the oil ready. Take a dough ball and dust it with plain flour. Roll this into a oblong shape. You can make this round too. Ensure the rolled bhaturas are thick. If it is thin it won't puff up well. Check whether the oil is hot or not by putting a pinch of dough into the oil. If it immediately pops up then oil is ready. Put the rolled bhaturas into the oil and fry on both sides. Take out and drain excess oil in a kitchen towel. Bhaturas are ready to serve. These bhaturas retained the puffiness for more than 15 minutes. Some people knead the dough with soda water to get nice puffed bhaturas. In that case do not add baking powder. Always roll the bhatura thicker, if it is thin it will become flat and won't puff up. Ensure the oil is super hot. Else bhaturas will absorb oil and won't puff up. Hi, cool recipe. Kindly correct at one place instead of thin u had mentioned as thick.Mentioned the sentence in quote. "Ensure the rolled bhaturas are thick. If it is thick it won't puff up well."